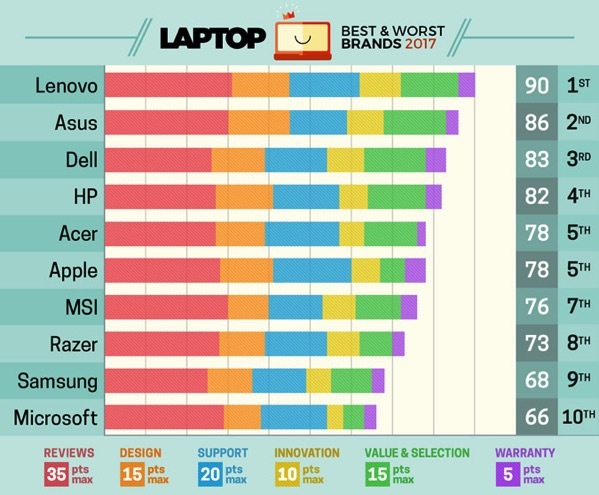 After leading the list for the past four years, Apple has been dethroned by Levono in Laptop Mag’s Best and Worst Laptop Brand rankings. Every year PC Mag evaluates the top notebook manufacturers and rates them in six categories: Design, Reviews, Tech Support, Warranty, Innovation and Value and Selection. Apple topped the list between 2013 and 2016 with its line of MacBooks, but last year’s models didn’t convince Laptop Mag: they ranked low in terms of reviews, scored only 28 points out of 35, and because they cost so much, they scored only 6 points out of 15 in the “Value & Selection” category. Laptop Mag notes about Apple: “The company’s MacBooks are slim, powerful and well-built, but you’ll need a pile of money and a bagful of dongles. 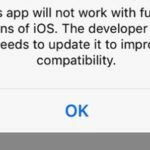 The company’s support and warranty options are second to none.” That’s the reason why Apple dropped to fifth place in this year’s rankings. Lenovo, on the other hand, had a great year, topping the 2017 list. The notebook manufacturer scored well in the ratings category, and, as the blog notes, three different ThinkPads lasted more than 17 hours on a charge (you hear that Apple? Compare that with the latest MacBook Pros with Touch Bar). In second spot we find Asus, which, according to the report, gives the best combination of “quality and features for the money”. In third is Dell, followed by HP. Despite being in sixth place, Acer received the same 78 points out of 100 as Apple.